Traditional looking on the outside with contemporary touches on the inside. 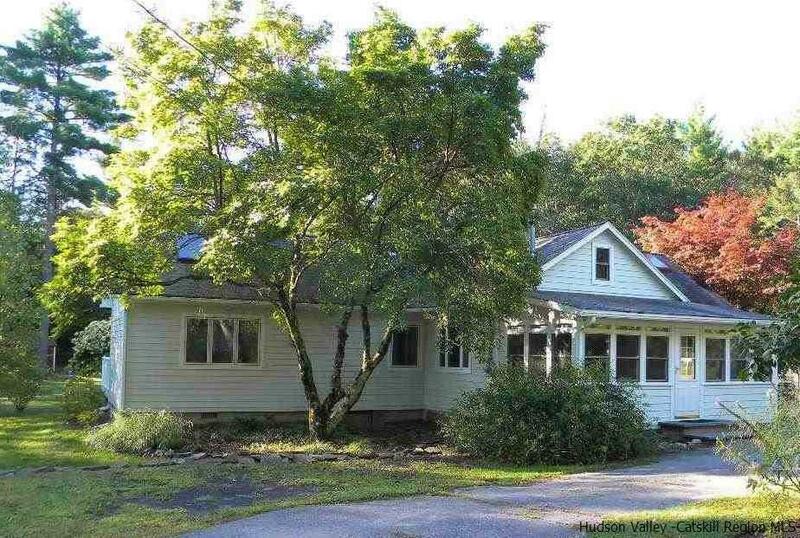 Charming 3 Bedroom, 2 Bath, circa 1935, year round cottage/ranch sited on 1.18 acres. Less than a 5 minute drive to the heart of Woodstock village, you can enjoy all the conveniences town has to offer. Cozy glass enclosed heated porch greets you as you enter large living room. Flanked by two bedrooms, and freestanding gas stove for cool mornings and evenings. Access to sun drenched deck, and eat in country kitchen. Beautiful hardwood and wood floors throughout. En suite master bedroom with soaring cathedral ceiling, skylights, and french doors to deck. Ample closet space and ceramic tiled full bath complete this light filled space. Great working kitchen with lots of oak cabinets, counter space, and pantry. Access off kitchen, to side deck for grilling and entertaining. Full bath with alcove for washer/dryer. Finished loft with upper deck, areas for single or twin beds, desk, drafting table. There's a working sink as well. Perfect work space or bedroom. Circular driveway with extended parking area can accommodate 4-5 vehicles. Large level, private rear yard, lined with trees, plantings, landscaping, and screened gazebo beckons you. This warm inviting property lends itself as a full time primary home or vacation rental. Towns of Woodstock and Saugerties, neighboring town to the east, have so much to offer. Fine dining, music, cinema, unique shops, antiques, hiking, and the wonderful energy of Woodstock.